My history with pot roast begins with the perfume of Kitchen Bouquet, expectations of potatoes, carrots and onions browned to perfection in au jus. These blended scents of spices, beef and vegetables wafted through our house and out windows in domestic stability. There was no escaping the power of those prophetic smells when I played outside. Mom didn’t need to call me to the table when I caught a whiff from her Dutch oven. For my Italian playmates, it was simmering spaghetti sauce and boiling pasta that yanked them home. My Polish friends ran toward the aroma of pierogi. Like bugs, we all scattered and disappeared at dinnertime. Ah, the fleeting, carefree 1950’s. My Irish father was the typical meat, potato and bread man, my Scott-German mother an exceptional cook and baker. She crowned her menu with cloverleaf light rolls, the finishing pre-dinner scent that glued me to my chair at the table. There I waited for Dad to reach for the first roll and commence our meal. Slathered with butter and sopped with gravy, I could’ve lived on Mom’s light rolls and roasted vegetables. The flavors nourished my childhood. I loved a pot roast. Except for the meat. Fork tender half the time and tough the other, a pang of dread dashed through me when Mom filled my plate. There’s nothing more delicious than tender beef, and nothing more miserable than eating fat and gristle. With its fickle reputation, I avoided a boneless chuck roast when I took up housekeeping. If my mother struck out half the time, a newlywed like me didn’t dare try. Then, one fateful day, that Kitchen Bouquet memory smote my taste buds and good sense. I called Mom for her recipe and promptly placed the dredged and dressed meat in my avocado green Club Aluminum Dutch oven. To my surprise and husband’s eager appetite, I served a tasty, tender dinner. 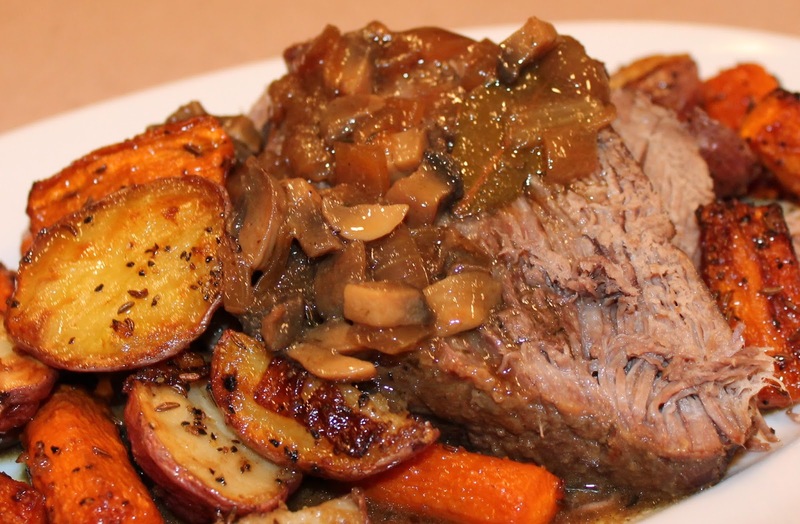 “I’ve never did like a pot roast,” my husband said. Really? Without debate, that unpredictable cut of beef fell out of favor in my kitchen. A faithful ground sirloin and vegetable pie soon occupied its place and became a family favorite. My daughters never knew what it was like to chew and swallow fat and gristle. Dear Reader, I thought pot roast was ironclad history until two weeks ago. I caved when a savory memory persuaded me to give it another chance. That’s all it takes, isn’t it, to chase a forsaken flavor and happy place in our lives? I lifted the pot’s lid, disappointed the vegetables weren’t browned like Mom’s. But oh, the meat compensated more than enough. “Mmmmm,” said my husband’s change of mind. Can’t give up now. Have to perfect browning those potatoes and carrots. Perhaps attempt my mother’s light rolls again and beat the odds. There’s plenty butter in the fridge, for old times’ sake.